For other uses, see Butterfly effect (disambiguation). A plot of Lorenz's strange attractor for values ρ=28, σ = 10, β = 8/3. 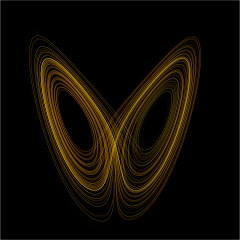 The butterfly effect or sensitive dependence on initial conditions is the property of a dynamical system that, starting from any of various arbitrarily close alternative initial conditions on the attractor, the iterated points will become arbitrarily spread out from each other. The idea, that small causes may have large effects in general and in weather specifically, was used from Henri Poincaré to Norbert Wiener. Edward Lorenz's work placed the concept of instability of the atmosphere onto a quantitative base and linked the concept of instability to the properties of large classes of dynamic systems which are undergoing nonlinear dynamics and deterministic chaos. In The Vocation of Man (1800), Fichte says that "you could not remove a single grain of sand from its place without thereby ... changing something throughout all parts of the immeasurable whole". Chaos theory and the sensitive dependence on initial conditions were described in the literature in a particular case of the three-body problem by Henri Poincaré in 1890. He later proposed that such phenomena could be common, for example, in meteorology. In 1898, Jacques Hadamard noted general divergence of trajectories in spaces of negative curvature. Pierre Duhem discussed the possible general significance of this in 1908. The idea that one butterfly could eventually have a far-reaching ripple effect on subsequent historic events made its earliest known appearance in "A Sound of Thunder", a 1952 short story by Ray Bradbury about time travel. In 1961, Lorenz was running a numerical computer model to redo a weather prediction from the middle of the previous run as a shortcut. He entered the initial condition 0.506 from the printout instead of entering the full precision 0.506127 value. The result was a completely different weather scenario. One meteorologist remarked that if the theory were correct, one flap of a sea gull's wings would be enough to alter the course of the weather forever. The controversy has not yet been settled, but the most recent evidence seems to favor the sea gulls. Following suggestions from colleagues, in later speeches and papers Lorenz used the more poetic butterfly. According to Lorenz, when he failed to provide a title for a talk he was to present at the 139th meeting of the American Association for the Advancement of Science in 1972, Philip Merilees concocted Does the flap of a butterfly’s wings in Brazil set off a tornado in Texas? as a title. Although a butterfly flapping its wings has remained constant in the expression of this concept, the location of the butterfly, the consequences, and the location of the consequences have varied widely. The phrase refers to the idea that a butterfly's wings might create tiny changes in the atmosphere that may ultimately alter the path of a tornado or delay, accelerate or even prevent the occurrence of a tornado in another location. The butterfly does not power or directly create the tornado, but the term is intended to imply that the flap of the butterfly's wings can cause the tornado: in the sense that the flap of the wings is a part of the initial conditions; one set of conditions leads to a tornado while the other set of conditions doesn't. The flapping wing represents a small change in the initial condition of the system, which cascades to large-scale alterations of events (compare: domino effect). Had the butterfly not flapped its wings, the trajectory of the system might have been vastly different—but it's also equally possible that the set of conditions without the butterfly flapping its wings is the set that leads to a tornado. The butterfly effect presents an obvious challenge to prediction, since initial conditions for a system such as the weather can never be known to complete accuracy. This problem motivated the development of ensemble forecasting, in which a number of forecasts are made from perturbed initial conditions. Some scientists have since argued that the weather system is not as sensitive to initial conditions as previously believed. David Orrell argues that the major contributor to weather forecast error is model error, with sensitivity to initial conditions playing a relatively small role. Stephen Wolfram also notes that the Lorenz equations are highly simplified and do not contain terms that represent viscous effects; he believes that these terms would tend to damp out small perturbations. These figures show two segments of the three-dimensional evolution of two trajectories (one in blue, and the other in yellow) for the same period of time in the Lorenz attractor starting at two initial points that differ by only 10−5 in the x-coordinate. Initially, the two trajectories seem coincident, as indicated by the small difference between the z coordinate of the blue and yellow trajectories, but for t > 23 the difference is as large as the value of the trajectory. The final position of the cones indicates that the two trajectories are no longer coincident at t = 30. An animation of the Lorenz attractor shows the continuous evolution. Recurrence, the approximate return of a system towards its initial conditions, together with sensitive dependence on initial conditions, are the two main ingredients for chaotic motion. They have the practical consequence of making complex systems, such as the weather, difficult to predict past a certain time range (approximately a week in the case of weather) since it is impossible to measure the starting atmospheric conditions completely accurately. A dynamical system displays sensitive dependence on initial conditions if points arbitrarily close together separate over time at an exponential rate. The definition is not topological, but essentially metrical. for some positive parameter a. The definition does not require that all points from a neighborhood separate from the base point x, but it requires one positive Lyapunov exponent. where the initial condition parameter is given by . For rational , after a finite number of iterations maps into a periodic sequence. But almost all are irrational, and, for irrational , never repeats itself – it is non-periodic. This solution equation clearly demonstrates the two key features of chaos – stretching and folding: the factor 2n shows the exponential growth of stretching, which results in sensitive dependence on initial conditions (the butterfly effect), while the squared sine function keeps folded within the range [0, 1]. The butterfly effect is most familiar in terms of weather; it can easily be demonstrated in standard weather prediction models, for example. The climate scientists James Annan and William Connolley explain that chaos is important in the development of weather prediction methods; models are sensitive to initial conditions. They add the caveat: "Of course the existence of an unknown butterfly flapping its wings has no direct bearing on weather forecasts, since it will take far too long for such a small perturbation to grow to a significant size, and we have many more immediate uncertainties to worry about. So the direct impact of this phenomenon on weather prediction is often somewhat overstated." The potential for sensitive dependence on initial conditions (the butterfly effect) has been studied in a number of cases in semiclassical and quantum physics including atoms in strong fields and the anisotropic Kepler problem. Some authors have argued that extreme (exponential) dependence on initial conditions is not expected in pure quantum treatments; however, the sensitive dependence on initial conditions demonstrated in classical motion is included in the semiclassical treatments developed by Martin Gutzwiller and Delos and co-workers. Other authors suggest that the butterfly effect can be observed in quantum systems. Karkuszewski et al. consider the time evolution of quantum systems which have slightly different Hamiltonians. They investigate the level of sensitivity of quantum systems to small changes in their given Hamiltonians. Poulin et al. presented a quantum algorithm to measure fidelity decay, which "measures the rate at which identical initial states diverge when subjected to slightly different dynamics". They consider fidelity decay to be "the closest quantum analog to the (purely classical) butterfly effect". Whereas the classical butterfly effect considers the effect of a small change in the position and/or velocity of an object in a given Hamiltonian system, the quantum butterfly effect considers the effect of a small change in the Hamiltonian system with a given initial position and velocity. This quantum butterfly effect has been demonstrated experimentally. Quantum and semiclassical treatments of system sensitivity to initial conditions are known as quantum chaos. The journalist Peter Dizikes, writing in The Boston Globe in 2008, notes that popular culture likes the idea of the butterfly effect, but gets it wrong. Whereas Lorenz suggested correctly with his butterfly metaphor that predictability "is inherently limited", popular culture supposes that each event can be explained by finding the small reasons that caused it. Dizikes explains: "It speaks to our larger expectation that the world should be comprehensible – that everything happens for a reason, and that we can pinpoint all those reasons, however small they may be. But nature itself defies this expectation." The survival horror adventure video game Until Dawn utilises the butterfly effect by altering the storyline later on whenever the player makes a decision. Seemingly unimportant decisions made by the players, such as whether a character peaks at somebody else's phone when a message alert sounds, may lead to the entire storyline being changed, such as the death of a character. 1 2 "Butterfly effect - Scholarpedia". www.scholarpedia.org. Retrieved 2016-01-02. ↑ Lorenz, Edward N. (March 1963). "Deterministic Nonperiodic Flow". Journal of the Atmospheric Sciences. 20 (2): 130–141. ↑ Steves, Bonnie; Maciejewski, AJ (September 2001). The Restless Universe Applications of Gravitational N-Body Dynamics to Planetary Stellar and Galactic Systems. USA: CRC Press. ISBN 0750308222. Retrieved January 6, 2014. ↑ Flam, Faye (2012-06-15). "The Physics of Ray Bradbury's "A Sound of Thunder"". Philadelphia Inquirer. Retrieved 2015-09-02. ↑ Gleick, James (1987). Chaos: Making a New Science. Viking. p. 16. ISBN 0-8133-4085-3. ↑ Lorenz, Edward N. (March 1963). "Deterministic Nonperiodic Flow". Journal of the Atmospheric Sciences. 20 (2): 130–141. Bibcode:1963JAtS...20..130L. doi:10.1175/1520-0469(1963)020<0130:DNF>2.0.CO;2. ISSN 1520-0469. Retrieved 3 June 2010. ↑ "Part19". Cs.ualberta.ca. 1960-11-22. Retrieved 2014-06-08. 1 2 Lorenz, Edward N. (1963). "The Predictability of Hydrodynamic Flow" (PDF). Transactions of the New York Academy of Sciences. 25 (4): 409–432. Retrieved 1 September 2014. ↑ "The Butterfly Effects: Variations on a Meme". AP42 ...and everything. Retrieved 3 August 2011. ↑ Woods, Austin (2005). Medium-range weather prediction: The European approach; The story of the European Centre for Medium-Range Weather Forecasts. New York: Springer. p. 118. ISBN 978-0387269283. ↑ Orrell, David; Smith, Leonard; Barkmeijer, Jan; Palmer, Tim (2001). "Model error in weather forecasting". Nonlinear Processes in Geophysics. 9: 357–371. ↑ Orrell, David (2002). "Role of the metric in forecast error growth: How chaotic is the weather?". Tellus. 54A: 350–362. doi:10.3402/tellusa.v54i4.12159. ↑ Orrell, David (2012). Truth or Beauty: Science and the Quest for Order. New Haven: Yale University Press. p. 208. ISBN 978-0300186611. ↑ Wolfram, Stephen (2002). A New Kind of Science. Wolfram Media. p. 998. ISBN 978-1579550080. ↑ "Chaos and Climate". RealClimate. Retrieved 2014-06-08. ↑ Heller, E. J.; Tomsovic, S. (July 1993). "Postmodern Quantum Mechanics". Physics Today. 46: 38. Bibcode:1993PhT....46g..38H. doi:10.1063/1.881358. ↑ Gutzwiller, Martin C. (1990). 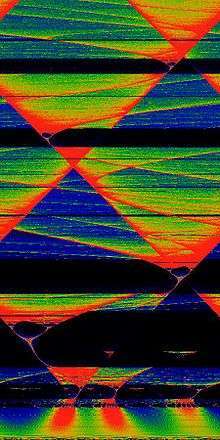 Chaos in Classical and Quantum Mechanics. New York: Springer-Verlag. ISBN 0-387-97173-4. 1 2 Rudnick, Ze'ev (January 2008). "What is...Quantum Chaos" (PDF). Notices of the American Mathematical Society. ↑ Berry, Michael (1989). "Quantum chaology, not quantum chaos". Physica Scripta. 40 (3): 335–336. Bibcode:1989PhyS...40..335B. doi:10.1088/0031-8949/40/3/013. ↑ Gutzwiller, Martin C. (1971). "Periodic Orbits and Classical Quantization Conditions". Journal of Mathematical Physics. 12 (3): 343. Bibcode:1971JMP....12..343G. doi:10.1063/1.1665596. ↑ Gao, J. & Delos, J. B. (1992). "Closed-orbit theory of oscillations in atomic photoabsorption cross sections in a strong electric field. II. Derivation of formulas". Physical Review A. 46 (3): 1455–1467. Bibcode:1992PhRvA..46.1455G. doi:10.1103/PhysRevA.46.1455. ↑ Karkuszewski, Zbyszek P.; Jarzynski, Christopher; Zurek, Wojciech H. (2002). "Quantum Chaotic Environments, the Butterfly Effect, and Decoherence". Physical Review Letters. 89 (17): 170405. arXiv:quant-ph/0111002 . Bibcode:2002PhRvL..89q0405K. doi:10.1103/PhysRevLett.89.170405. ↑ Poulin, David; Blume-Kohout, Robin; Laflamme, Raymond & Ollivier, Harold (2004). "Exponential Speedup with a Single Bit of Quantum Information: Measuring the Average Fidelity Decay". Physical Review Letters. 92 (17): 177906. arXiv:quant-ph/0310038 . Bibcode:2004PhRvL..92q7906P. doi:10.1103/PhysRevLett.92.177906. PMID 15169196. 1 2 Poulin, David. "A Rough Guide to Quantum Chaos" (PDF). Archived from the original (PDF) on 2010-11-04. ↑ Peres, A. (1995). Quantum Theory: Concepts and Methods. Dordrecht: Kluwer Academic. ↑ Lee, Jae-Seung & Khitrin, A. K. (2004). "Quantum amplifier: Measurement with entangled spins". Journal of Chemical Physics. 121 (9): 3949. Bibcode:2004JChPh.121.3949L. doi:10.1063/1.1788661. ↑ Dizikes, Petyer (8 June 2008). "The meaning of the butterfly". The Boston Globe. Retrieved 8 June 2016. ↑ "Until Dawn has hundreds of endings and thousands of branches". Destructoid. Retrieved 2016-11-26. James Gleick, Chaos: Making a New Science, New York: Viking, 1987. 368 pp. Devaney, Robert L. (2003). Introduction to Chaotic Dynamical Systems. Westview Press. ISBN 0670811785. Hilborn, Robert C. (2004). "Sea gulls, butterflies, and grasshoppers: A brief history of the butterfly effect in nonlinear dynamics". American Journal of Physics. 72 (4): 425–427. Bibcode:2004AmJPh..72..425H. doi:10.1119/1.1636492. Look up butterfly effect in Wiktionary, the free dictionary. Weisstein, Eric W. "Butterfly Effect". MathWorld.